It's amazing what you ignore when you're waking in the woods. The only reason I noticed this plant was because of a frosty walk we took in Point Pleasant Park in Halifax late last Fall. Everything was touched with frost and quite dead looking—except for one ground hugging dark green, tiny, insignificant plant. What caught my eye were the berries. Small, bright red glowing orbs. Beautiful. I thought they looked familiar, and when I went looking I found out they were called Partridgeberries. 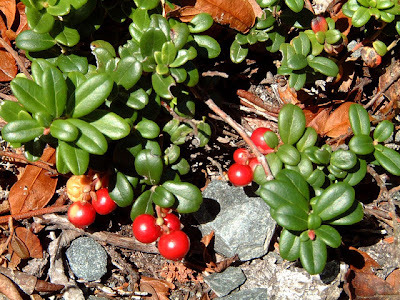 Partridgeberries go by many names: cowberry, red whortle berry, foxberry, northern mountain cranberry, dry ground cranberry, rock cranberry, whimberry and of course lingonberry. Partridgeberries are small, red, edible berries that grow on a perennial, low growing "shrub." The "shrub" can grow from completely prostrate on the ground to up to 16" high, depending on growing conditions. 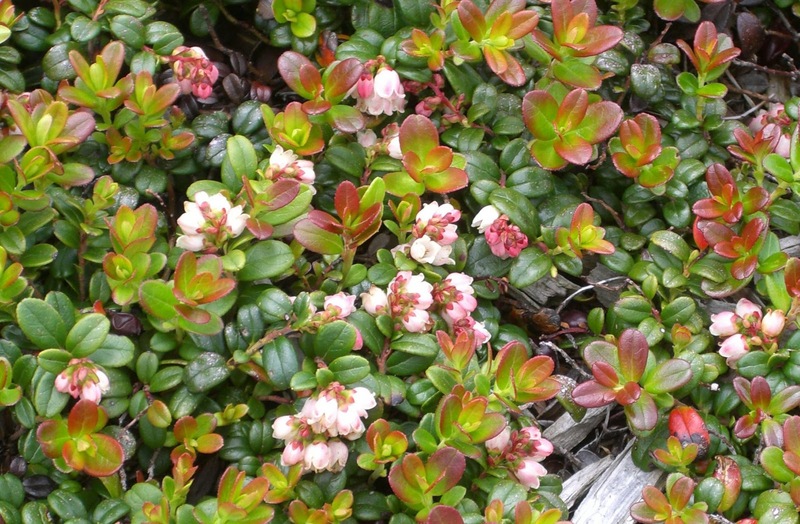 The leaves are small (1/4" to 1") with a distinctive division down the centre.They are related to both blueberries and cranberries. Partridgeberries fruit twice each year, first in July and again in late September to early November. 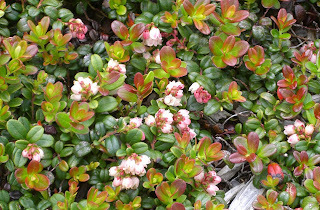 They are found growing in Scandinavia, Alaska, and northeastern Canada. Since partridgeberries are closely related to cranberries, they probably have a similar nutritional content, although exact data is unavailable. It is known that they are a good source of vitamin C.
Partridgeberries also contain anthocyanin, a potent antioxidant. Researchers believe that these substances can help reduce the risk of heart disease, heart attack and cancer. Anthocyanins help prevent the oxidation of cholesterol in the blood. By doing so, they keep blood vessels healthy. Therefore, anthocyanins play a preventive role in the early stages of America's number one killer, heart disease. Researchers believe anthocyanins may also help decrease inflammation and stop cancer before it gets started. Grease and flour a bundt pan. Cream butter and sugar together in a mixing bowl. Add the eggs one at a time. Mix to combine. Add the milk and mix well. Then beat in the cinnamon, cardamom and vanilla. In a separate bowl combine flour and baking powder. Gradually add the flour mixture by stirring with a spoon. Add berries and stir just until blended. Bake until golden brown and a cake tester comes out clean, about 45 minutes. Remove cake from oven. While still warm, poke holes in the cake with the back of a (skinny) wooden spoon. 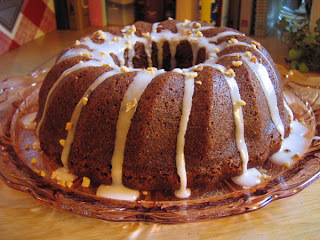 Pour the sweetened condensed milk over the top and let cool. Can anything with a sweetened condensed milk drizzle taste bad?